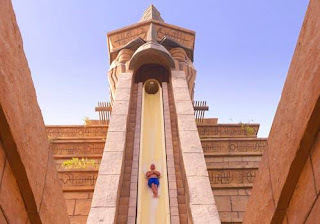 Topik: Atlantis Hotel in Dubai ! Bagi yang merasa " Di atas ", apakah masih merasa " di atas " sekarang ????? Subject: FW: Atlantis Hotelin Dubai ! 1. 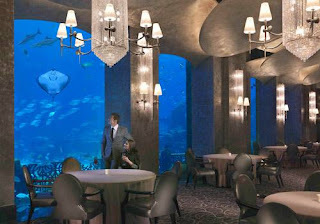 Water world ... the Atlantis Hotel in Dubai , one of the world's most anticipated hotels, finally opens its doors on September 24. 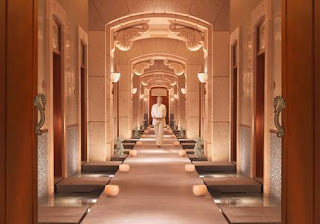 Situated on 113 acres of the Palm Jumeirah, the hotel boasts over 1539 rooms. 2. 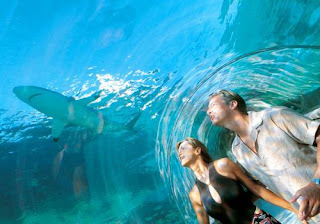 Water bed ... the Neptune and Poseidon Suites are exclusive to Atlantis, with both bedroom and bath views directly into the mesmerising underwater world of the Ambassador Lagoon. 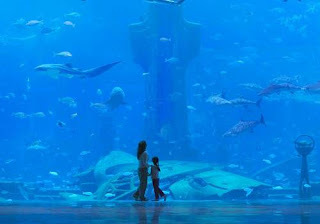 3.. Sea view ... the Ambassador Lagoon is a window into the wonders of the ocean, and the centre-piece of Atlantis, with over 250 species of fish and sea creatures. 4. Fish surprise ... keeping with he water theme, the Lost Chamber is a maze of underwater halls and tunnels under the Ambassador Lagoon with over 65,000 fish. 5. 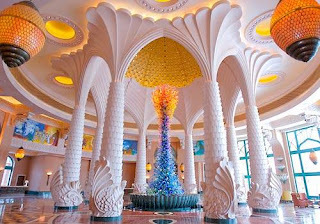 See sea food ... Ossiano is home to a three-star Michelin chef, and offers gourmet seafood with views of the exotic marine life of the Ambassador Lagoon. 6. 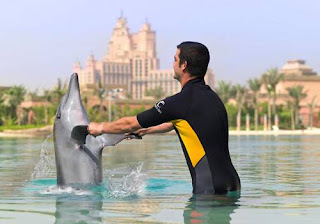 Pleased to meet you ... Dolphin Bay is a four-and-a-half hectare lush tropical setting where you get the chance to meet the colourful characters in their natural habitat. 7. 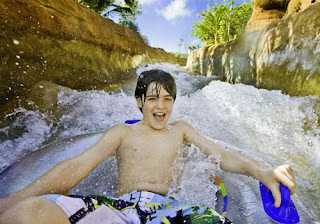 Big dipper ... Aquaventure is a 42-acre waterpark with the Zigguret Centerpiece that touts a 27.5m vertical drop. 8. 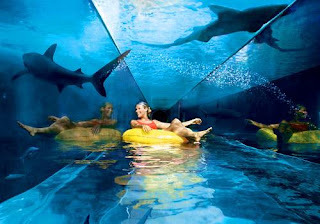 Shark tank ... after the Ziggurat, you will emerge slowly through the lagoon at Shark Attack. 9. All washed up ... the Rapids is a 2.3km path of tidal river with one metre waves though a lush tropical landscape. 10. 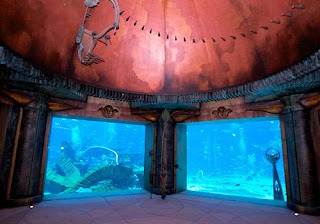 Shark proof ... you can also experience the Shark Tank from the dry, and more comfortable, viewing chamber. 11. Bar view ... sip cocktails in the oceanic space of Barazura and enjoy views overlooking Palm Jumeirah. 12. Grand view .... the Grand Lobby makes a colourful first impression. 13. 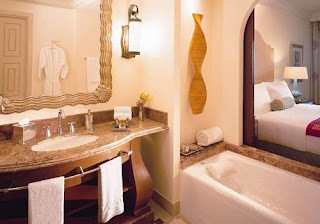 Bath time ... the spa experience includes two hours of spa treatments, your own private time in a jetted tub and access to both indoor and outdoor relaxation areas. 14. 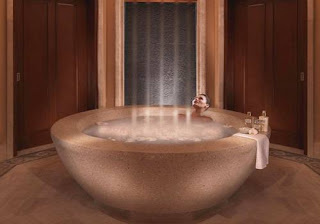 Spa service ... the Royal Spa Suite offers treatments designed to individual needs, and a spa menu delivered by private butler service. 15. 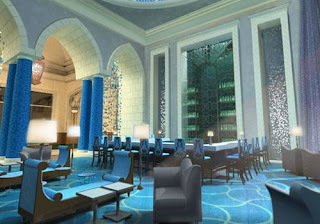 Grand designs ... each of the 1373 spacious guest rooms and 166 suites is designed with subtle oceanic and Arabic influences. Sekarang Anda dapat memiliki email di @ymail.com dan @rocketmail.com. 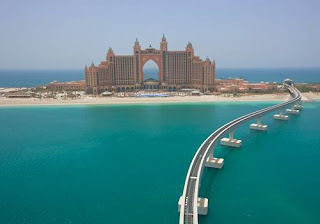 Trs: Atlantis Hotel in Dubai !